DURHAM, N.C. (AP) — Duke’s star-studded freshmen are facing another first, one not many expected this soon — if ever — during their presumably short college careers. Now they’re ready to show what lessons they learned from their first defeat, starting Tuesday night against Indiana in the ACC/Big Ten Challenge. 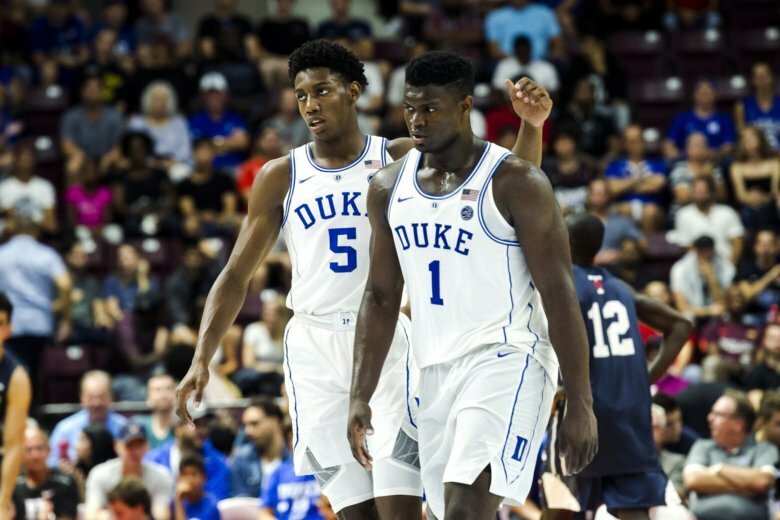 This latest group of young Blue Devils (5-1) drew comparisons to some of the greatest freshman classes in the sport’s history — including Michigan’s famed “Fab Five” in the 1990s — after blowing out then-No. 2 Kentucky to climb to No. 1, routing a couple of outmanned mid-majors at home, then winning two games in Maui during a 5-0 start. But a loss to Gonzaga — which propelled the Bulldogs to the top spot in the AP Top 25 and dropped Duke to No. 3 — took care of that undefeated talk and showed why it might be wise to pump the brakes on the hype train. “We’re trying to learn, go through a different experience every day,” Barrett said. ESPN analyst and former college coach Fran Fraschilla believes these Blue Devils have “a chance to be as good as the Kentucky classes in ’09 and ’11” but pointed out that few one-and-done-dominated teams have won the NCAA Tournament. And as impressive as they’ve been to start their college careers, how they’ll fit at the next level remains an inexact science. Utah Jazz rookie Grayson Allen has a unique perspective. He was part of Duke’s recruiting class in 2014-15 led by eventual one-and-dones Okafor, Winslow and Tyus Jones and won the national title. When they left, he stuck around, and his other three Duke teams were stacked with one-year players that didn’t advance quite as far in the NCAA Tournament. “You hear people saying undefeated, they can’t be stopped — they have to do as best they can to ignore that and keep improving,” Allen said. “If there’s anything I learned from four years of college basketball, the tournament and college basketball does not care who’s good in November or December. All (that matters) is March and that first week of April. It’s very unforgiving. Krzyzewski has figured out how to handle one-and-done players, cycling 14 of them through his program since Kyrie Irving started the run in 2011. Four were around last year: Marvin Bagley III, Wendell Carter Jr., Gary Trent Jr. and Trevon Duval. But the comparisons end there, he said. One key difference: His freshman class could lean on veterans Quinn Cook and Amile Jefferson for advice and support. With only one non-freshman averaging more than 20 minutes, that’s not a luxury the current Blue Devils have. If not, the Hoosiers are capable of hanging the second loss on the young Blue Devils.